Skinship (スキンシップ) is a wasei-eigo, or a Japanese word coined using English root origins, initially to describe the closeness between a mother and her child due to the physical contact of their skin. Skinship develops through breastfeeding, co-sleeping, baby massage or simply by carrying and holding your baby. This blog is about how parents and children can help each other to develop their emotional, social and intellectual potential and live a fulfilling life. 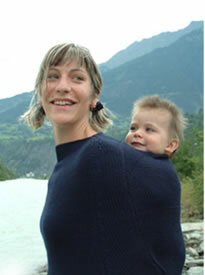 If you are pregnant or are babywearing your little one, you will love those mama-jackets and mama-ponchos. They can be used all the way through pregnancy and are very useful when you are wearing your baby or toddler in any kind of soft carrier (slings, poches, mei-tais, etc.). You can carry your baby in front or at the back. We are using mama poncho all the time...while baby wearing and also while Jun is in the stroller where it turns into a comfortable and warm blanket. For more details, photos and purchasing click here. Homeopathic Medicine, Holistic Health, and Natural Parenting with Lauren Feder, M.D.